This week I will begin a series for the intrepid champagne-taste-beer-budget homeowner/decorator, those who know their taste and are willing to try it on their own. Today, we’ll go through my favorite online sources to find to-the-trade-only fabrics, and then, in future weeks, where you can send those fabrics to upholster the pieces you have, find, or want. Please note that, while these sources have very good prices, in many instances a designer will get even better pricing and have a number of resources for American-made upholstered furniture at great prices that a consumer can not access. I have learned this lesson the hard way. Finding that Craigslist or consignment store chair and having it reupholstered is NOT ALWAYS THE BEST VALUE. But if you already have something and you want to give it new life, or if you find something unusual with great bones and study construction or for absolutely dirt cheap, go for it! First off, let me disclose that to find the deepest discounts, you have to be open to what you find in the appropriate yardage for your project (usually they are remnants), and that takes a lot of searching and a lot of luck. If you have a specific fabric in mind, but can’t order it unless you hire a designer, check out Decorator’s Best and Inside Fabric. For some reason, Decorator’s Best is usually a few dollars cheaper per yard, but Inside Fabric carries a few brands that DB doesn’t. Prices are above wholesale, but there isn’t an enormous markup. You won’t find your handmade block prints there, but they carry almost all the other well-known brands. Next, this will not be a roundup of the coolest, most fun prints on the web. For that, head to Emily Henderson’s post here. It will make your head spin in a happy way. 🙂 Rather, I will look at places you can source remnants from Schumacher, Quadrille, Duralee, Fabricut, Donghia, Scalamandre, and more. You know, the stuff they sell in the design centers in the major metropolises across the country and that’s available to the trade only. You won’t be able to upholster your whole house or create your entire fabric scheme, but you may be able to do a key piece like an ottoman, chair, or settee, a couple fantastic pillows, or some drapes to boot. Below are some fun finds, not even scratching the surface! Fabric Guru specializes in buying large lots, store liquidations, remnants, closeouts, and overruns. Because of these buying methods, they can sell many items below wholesale cost, a 50%-90% savings from normal retail prices. Fabrics are inspected by trained experts to insure top quality. Shipping is always $4.99, which is incredible if you’re buying a bolt of 20 yards of fabric. The rub — samples are only allowed for fabric for sale by the yard, not the precut remnants. Returns are always allowed if it doesn’t work out, but return shipping is probably going to be more than $5. My suggestion — get a sample from DB or IF, then order from Fabric Guru if it works out. I LOVE this place. They have a huge selection of Robert Allen fabrics, among other designers. Great source for solids. One of my best scores on Fabric Guru was the velvet for these dining room cushions. Robert Allen Italian Velvet in Pumice. I think it is discontinued now, but at the time, it was for sale on DB for more than $100/yard. I got 6.2 yards (perfect for 6 cushions!) for $106! Remnants and discontinued fabric and wallpapers from Alan Campbell, China Seas, and Quadrille. Be still, my heart! You have to call for samples, and the person on the phone doesn’t always know that you’re calling for a sample from the online outlet and not from the Quadrille showroom, so be sure to specify. What started out as a hobby for Shannon Darby, turned into a passion. As a result of her search for quality fabrics and great deals, she makes quantities of fabric that she doesn’t need for specific projects available on her blog site. Sourcing from remnant sales, warehouse sales, outlets, or wholesale vendor relationships, Shannon offers remnants, reclaimed fabrics, and bargain prices. She even tries to find images of the fabrics in-use for your inspiration. Check daily or lose out. All sales are one-time deals and cannot be reordered. Below is just a sampling of some of the things I wish I’d had a place for in the very recent past. Another wholesale/closeout vendor. Less of a selection and doesn’t always have the best price, so definitely do your homework before buying. However, sometimes you can find deals below wholesale on current fabrics. Ebay is amazing for fabrics. Sometimes you can get super lucky and find exactly what you’re looking for, sometimes you need to go in with an open mind. Great for finding linen or mohair velvets, which are usually really expensive retail. Use your designer and maker names for searches — Schumacher, Scalamandre, Duralee, Cowtan and Tout, John Robshaw, Robert Allen, Lee Jofa, Brunschwig & Fils … you get the idea. Believe it or not, I sourced both the Donghia mohair velvet on the chair and the Ralph Lauren leather on the ottoman (more on that ottoman in a future post) in the below picture from eBay. Check out a couple of my go-to stores — CC Supply Direct (designers velvets and Ballard Designs fabrics especially) and designerfabricsrr* (great source for leather, among other things). Gray Line is located in the fabric district New York City and offers a fabulous selection of durable linens and related products from Europe. I didn’t know about the store when I lived there, and I so wished I could have visited in person. I’ve used their fabrics on a couple of projects. Below, we used the Judy Linen in #24a Wheat to coordinate with the Restoration Hardware bed the homeowners already had and used a subtle tape trim in taupe, gold, and fuchsia (doesn’t show well in this photo) inset about 1.5 inches. For the dining room below, I wanted to use Ballard Designs Courbé Ottomans, but Ballard didn’t have a fabric of the feel and exact color I wanted. I decided to use Ballard’s COM (Customer’s Own Material) program, and had Gray Line send them the Upholstery Linen (55%) Cotton (45%) in the HC002 colorway. The project turned out perfectly. 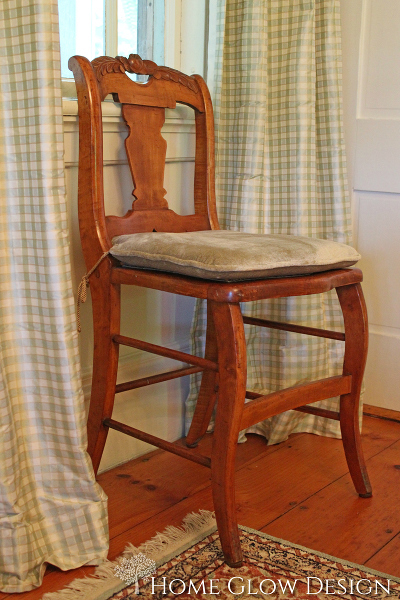 I recommend the Judy and Warsaw linens for drapes (don’t forget lining to make them hang well, though!) and the Upholstery 55/45 for furniture. They carry a nice line of drapery silks, too, at very affordable prices. Hope this has been helpful! Have you made any great finds? If so, I’d love to hear, and if you have any questions, just give a shout out! ‘Til next time….